ATN NVBNB05XH0 NVB5X-HPT Night Vision Binocular FREE SHIPPING! The ATN NVB5X-HPT is a night vision binocular that guarantees premium image quality, all-weather functionality and extreme magnification for law enforcement professionals in the field. 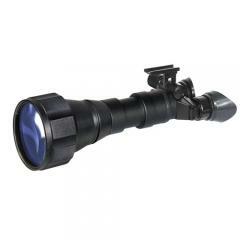 Its 5x magnification, premium multi-coated all-glass optics and large objective lens provide exceptional image clarity and contrast even at long distances--ideal for performing nighttime surveillance operations from a safe distance. When ambient light levels reach zero, the detachable infrared illuminator captures enough light to produce clear imaging. A battery warning and IR indicator are located inside the viewfinder, allowing for rapid status checks while the binoculars are in use. The housing and optic tube are weather and fog-resistant, ensuring use in all conditions. ©2002-2019 CopsPlus.com: ATN NVBNB05XH0 NVB5X-HPT Night Vision Binocular FREE SHIPPING!